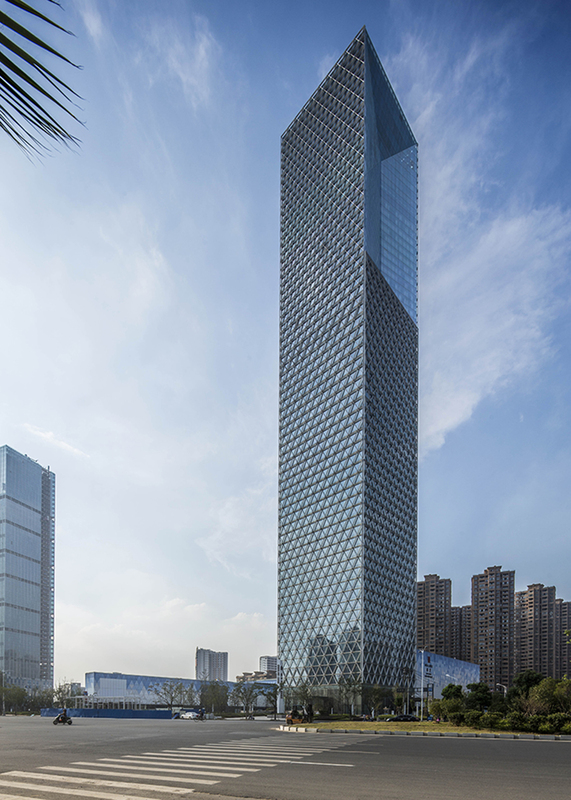 The Jiangxi Greenland Zifeng Tower, a striking presence on the Nanchang skyline, accommodates a mixed-use program of hotel, retail, and office space; elevates the visibility of the Gaoxin business district; and meets both needs in a highly sustainable way. At ground level, the site is an important meeting place and thoroughfare for the neighborhood, landscaped to create a cohesive design that extends from the ground plane to the roof of the retail podium. 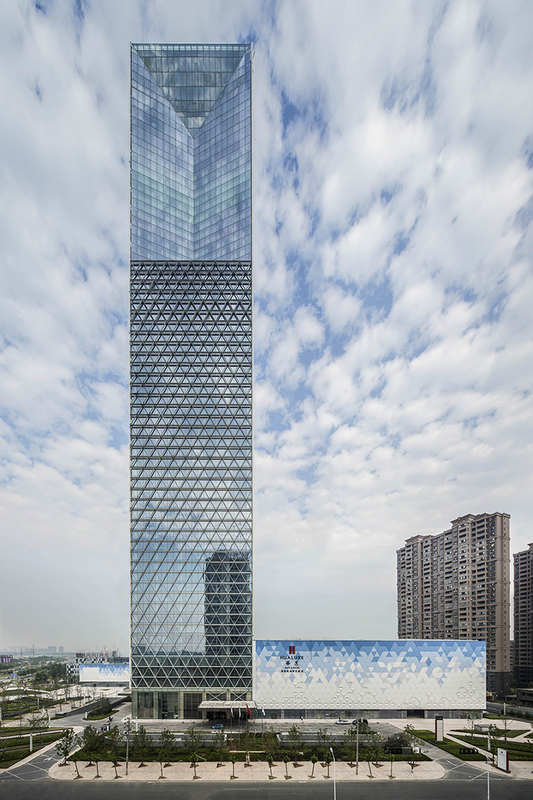 The tower has a central core, ensuring floor plates are highly flexible. Office floors occupy the bottom two-thirds of the building, while the top 18 stories house a luxury hotel. The change in program near the top is registered by the “Great Window”—an aperture carved into the tower’s mass. 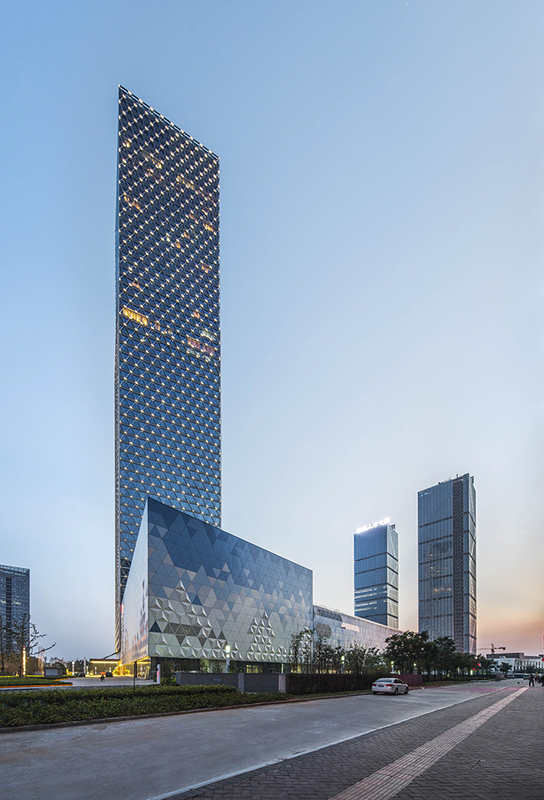 Formally, the Great Window transitions the floor plates to a suitable size and layout for the hotel function while distinguishing the tower on the skyline. 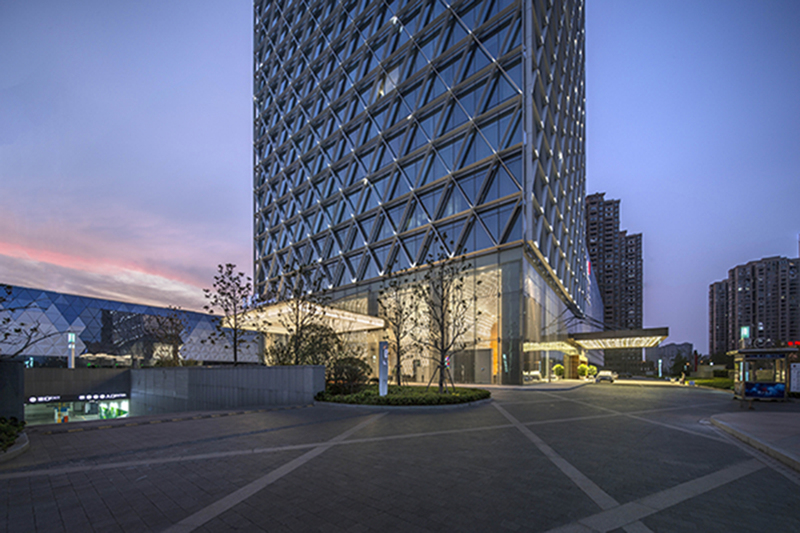 The aluminum diagrid shading-fin system adds a geometric texture to the building, drawing attention to the two primary programs, as well as preventing excessive solar heat gain. The diagrid is also programmed with tiny LED lights that provide illumination at night at a fraction of the energy expenditure of buildings programmed with more conventional lighting sources. 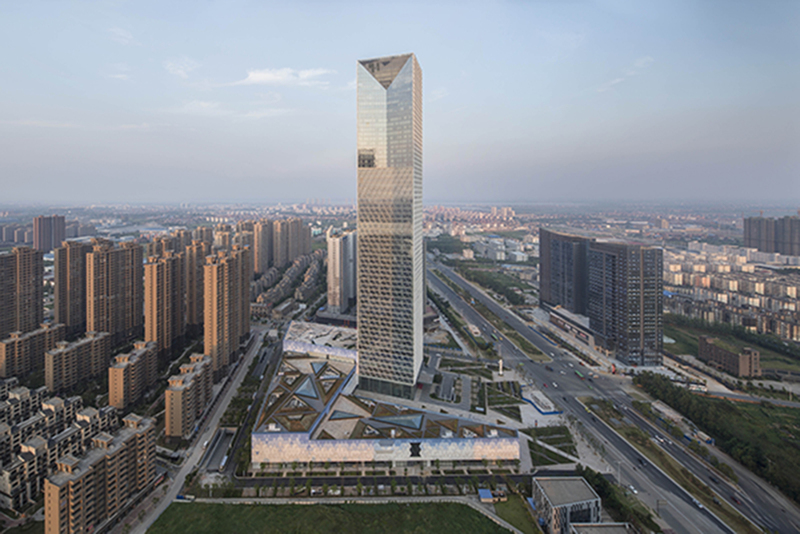 The tower incorporates other high performance features that help it achieve LEED© Silver certification, including high-performance glass and low-flow features. 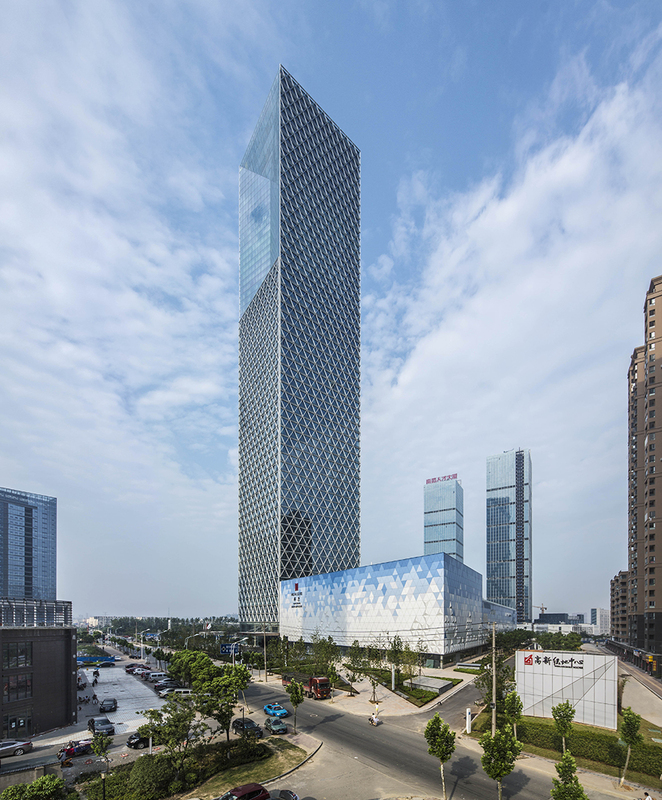 Enhancing public space and seamlessly integrating a variety of programs, the mixed-use Jiangxi Greenland Zifeng Tower indicates that the future development of China’s burgeoning cities can be both environmentally responsible and beautiful.